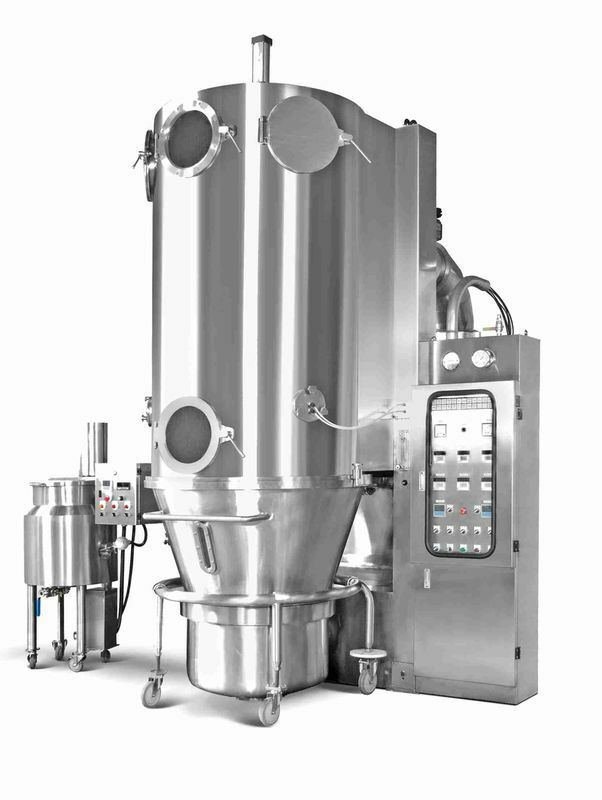 For Dryer / Granulation in batch mode, the dry starting product is placed in the product container. Here it is mixed vigorously in the heated gas stream, held in suspension and agglomerated/granulated by spraying with a suitable bonding material. The product is then dried to the required end moisture content with high heat and material transition coefficients. Particularly fast drying even of temperature-sensitive products. Very effective type of solid drying. Intensive mixing of the solid material. 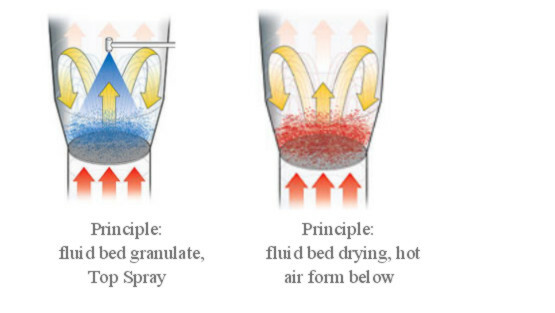 Uniform spraying of all particles in the fluid bed. Mixing → Granulation → Drying Consistent operation. 2. Grain size randomly adjustable subject to a wide variety of needs. Fast grain making without any damage to product effectiveness and flavor. Grains with perforated dispersion and high flow ability to make solution easy. Machine main body made of stainless steel , surface polished to make washing clean easy. Filter bags made of special conductive fiber effectively to eliminate statices and prevent spark discharge. Explosion relief hole to be mounted on top side of machine subject to the need of factory site. 8. Filter bag timing shaking device to ensure effective drop of attachments from filter bags through shaking force. 9. Fresh air filtered through high efficiency air filter. Spray gun easy for angle adjustment , randomly adjusting spraying pattern air volume , during operation. drying for powder or granule which contains moisture. spray binder or active ingredients on tiny powder to combine in granules, drying until required moisture content. • Contact parts AISI 316 non contact parts AISI 304. • Multi-pore bottom plate and stainless steel net. • With 4 freely movable casters. • 1 sight window for observation of work item flow. • 1 sample taker to remote specimen for checking during operation without stopping the unit. • 2 operation holes with sight window. • 1 blast release vent. • 1 container air-tight silicone lifter it is avoid use the cylinder makes in-convenience of cleaning. • Woven of specific cloths of conductive fibers with grounding to keep out static and spark discharge. • Filter bag with lifter. • 1 silicone tire for air-tight filter bag. • 1 set of exhaust fan. • 1 set of exhaustion damper of pneumatic operation to control air volume at no stage. • Regular steam heater of high efficiency and accurate temperature control. • 1 Ground type control box. • Digital automatic temperature controller for accurate hot air temperature control. 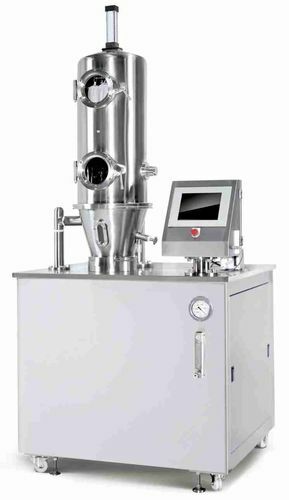 • Automatic shaking of filter bag at pre-set timing. drying b. Chinese medicine: granulating of concentrated liquid, drying. • Food Instant food: Health food, coffee, fruit favored milk powder, instant juice powder, seasoning, jelly powder, pudding powder, food additive. No. 70, Gengzhou Rd., Wugu Dist., New Taipei City, 24874 Taiwan R.O.C. (Google Map).